AVE supplies a wide variety of new equipment, the selection of which is based on knowledge and experience. We are not sole agents for any one manufacturer, and this provides us with the freedom to recommend equipment based purely upon merit and performance. Alternatively, we carry an extensive stock of refurbished vacuum pumps and equipment, which are competitively priced if your budget is restricted. When it comes to older, belt driven pumps, especially Edwards pumps, we are often able to source and supply spares for these obsolete pumps and equipment. All our Vacuum Bell Jars and Cylinders are manufactured from Borosilicate glass with the edges ground. After manufacture each bell jar and cylinder is annealed to give maximum strength and minimum stress within the material. Please see our page for Bell jars for further details, including sizes and accessories available. Please contact our sales team with details of your particular application, who will be only too pleased to help you. We are confident we will be able to supply you at competitive rates. Take a look at our Vacuum Bell jars and Cylinder page for a selection of the range that we offer. 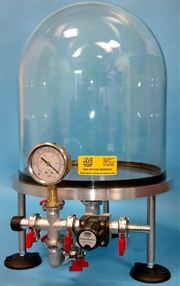 We can also offer a complete Vacuum Belljar System. We can also offer Stokes Vacuum Equipment Repairs .